The war on drugs comes to the big screen in a very visceral rendition with Sicario. If not wholly successful as a film, it certainly has merit as an aesthetic and thematic exercise. Plot and character work made seem crucial areas to fall down on, and indeed I am not sure it all comes together in the end, but there’s enough here for an interesting watch that had me alert throughout. The story introduces Kate Macer (Emily Blunt), an FBI officer who volunteers for an interdepartmental task force to take on the cartels who are causing havoc beyond the border and steadily poisoning the US. She follows the shady government operative Matter Graver (Josh Brolin) on a grueling expedition into Juarez, across from El Paso, and meets his even more mysterious associate Alejandro (Benicio del Toro). This is the foundation for the dark and morally dubious turns that the war on drugs takes. Now, from the sound of that, you probably assume that there’s a deep seam of rich character work deriving from conflicts of personal morality. A character may be driven to do extreme things to meaningfully tackle the brutal world of drugs and violence which promises to strike out at any moment. Alas, this isn’t the case. Agendas are relatively transparent and the film does not seem interested in more than a surface level of what the main players want and what they are willing to do to achieve that. That’s not to say that the actors in Sicario are poor. There is just little platform for the actors’ skills. Emily Blunt puts not a foot wrong but I struggle to imagine anyone being too deeply invested in Kate because she, as the audience surrogate, acts mostly as a passive observer and eventual cat’s paw. Matt offers little beyond driving the plot along and Alejandro’s mystery is sadly revealed and rendered quite generic, meaning the main appeal of del Toro’s character evaporates. Daniel Kaluuya is good as Kate’s friend and colleague Reggie but I can’t really think what his role was needed for in the film. This could be damning. 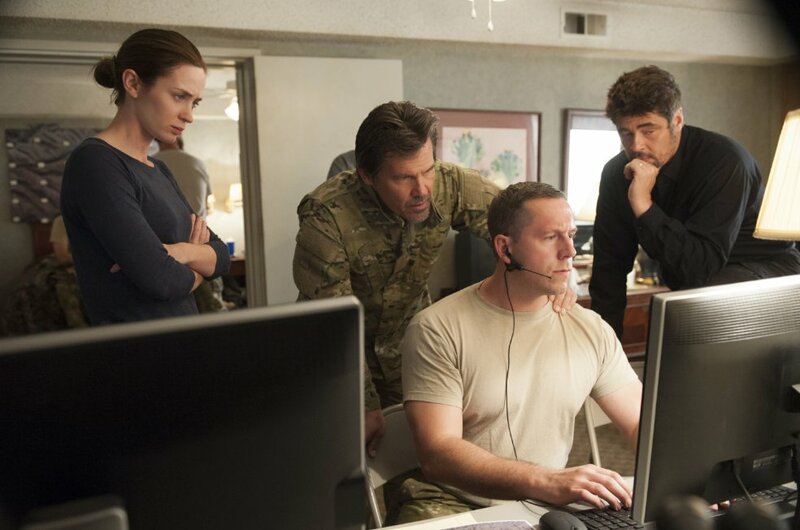 It is a flaw with Sicario yet it didn’t really undermine the enterprise so much until the very end, when narratively it did not amount to anything beyond its initial trajectory. Stylistically, it carries itself well. There’s an earnestness that comes across without being po-faced and it has this strange and refreshing atmosphere: being a political thriller shot with the sensibility of a very good horror film. The use of dead bodies, particularly those mutilated and displayed by the cartels, is quite powerful in a time when the pervasion of violence in our media made me think I was totally desensitised. 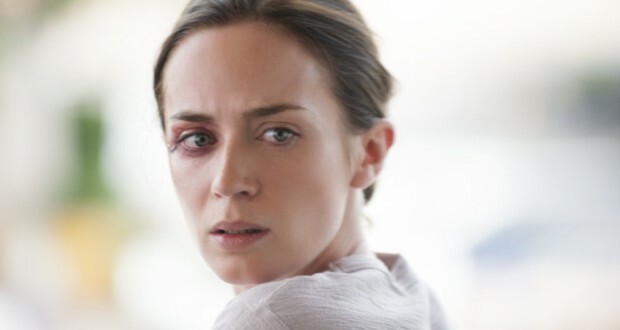 And it is not simply the approach to the gore that elevates Sicario. The cinematography is very exposed so that, especially outside, you get the sense characters are having their fraught nerves baked in the unceasing daylight sun. And then the night comes and the shadows are all-engulfing. It isn’t chiaroscuro but the lighting and contrast in the film are masterful. It’s only ever too bright and exposed or too dark and concealed. There’s no restive environment. Furthermore, we’re treated to lots of topographical shots, where the camera rolls over hillsides and plains and later rests on the sprawling structures of Juarez. Overlaid is this grungy thrumming sound, mixed in with the music, that seems to be exuded by the landscape itself. There’s a sense that the very earth is pulsing with malevolence that we firstly attribute to the cartels and later find indistinguishable from the gleeful malice of the American authorities. There’s tension and suspense, cagey fear and dread in Sicario. This intoxicating broth of unease and often impotent rage is a lot of why the film can sustain itself for so long. 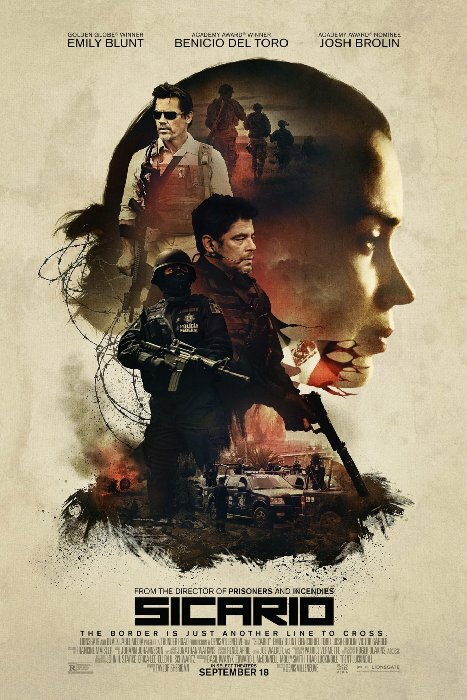 I don’t find myself able to recommend Sicario as some sort of great or insightful political thriller but it’s an interesting film where the tone and theme of the piece is far outperforming its content. I am glad I saw it but can only really direct people towards it without the promise of a wholly satisfying experience at the end. Verdict: Curious, ambitious but critically flawed, Sicario is a gripping but not altogether successful movie. 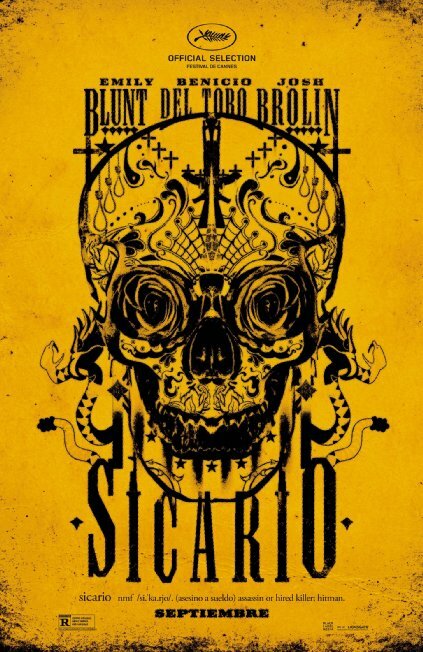 Sicario is on general release in the UK, USA and Australia.